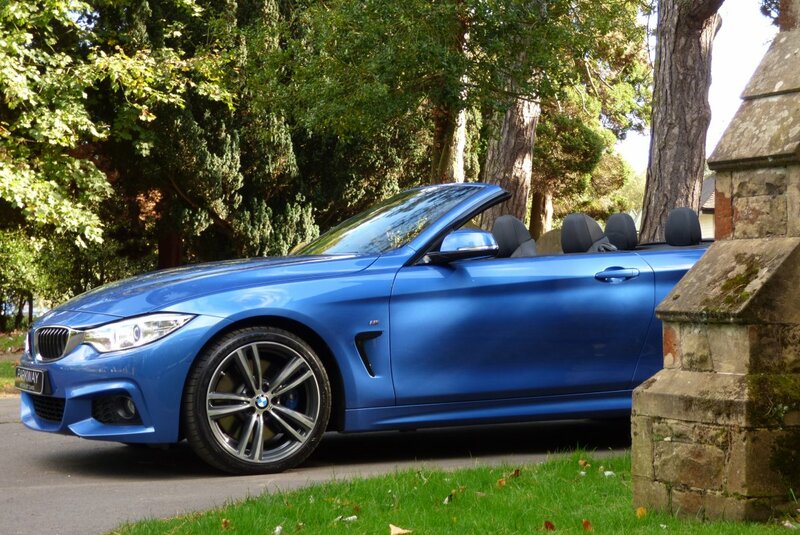 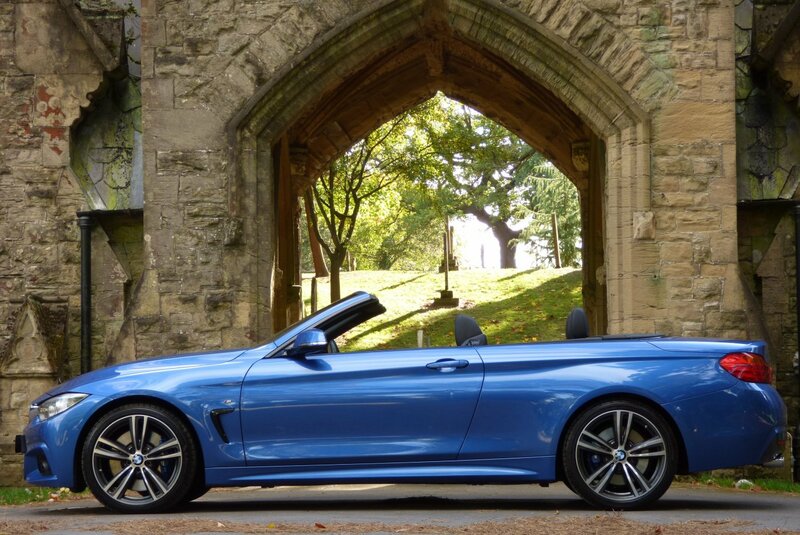 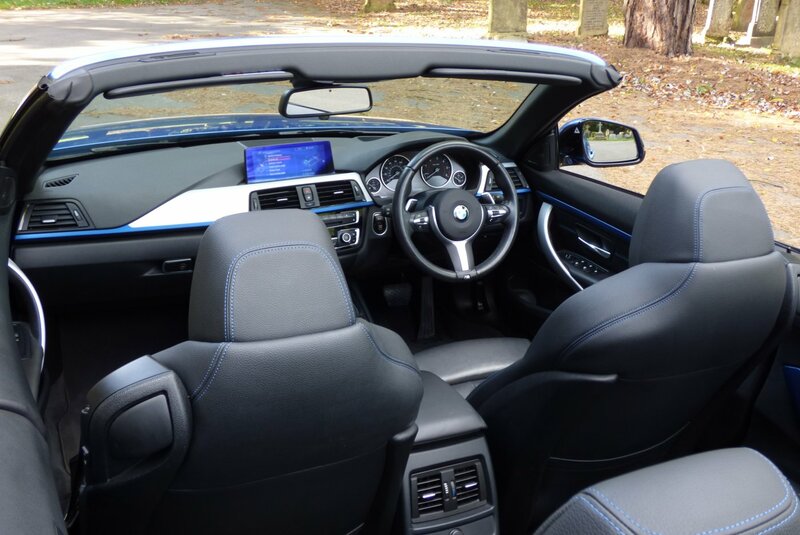 The BMW 4 Series Was Unveiled In September 2013 At The Frankfurt Motor Show With The Convertible Body Being Unveiled At The Tokyo Motor Show in 2013. 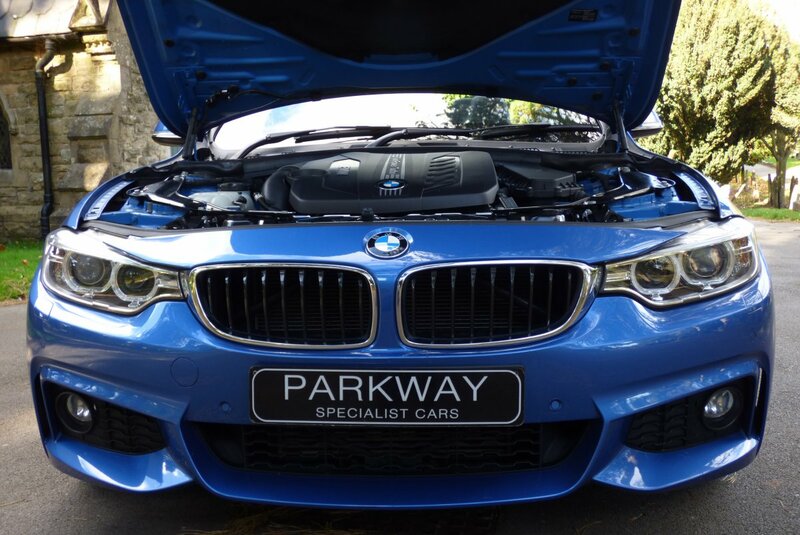 Launched As A Replacement For The Much-Loved E92/E93 3 Series, The 4 Series Or F33 Was An Instant Hit With The Public Due To Its Combination Of Sleek Styling And Modern Day Technology. 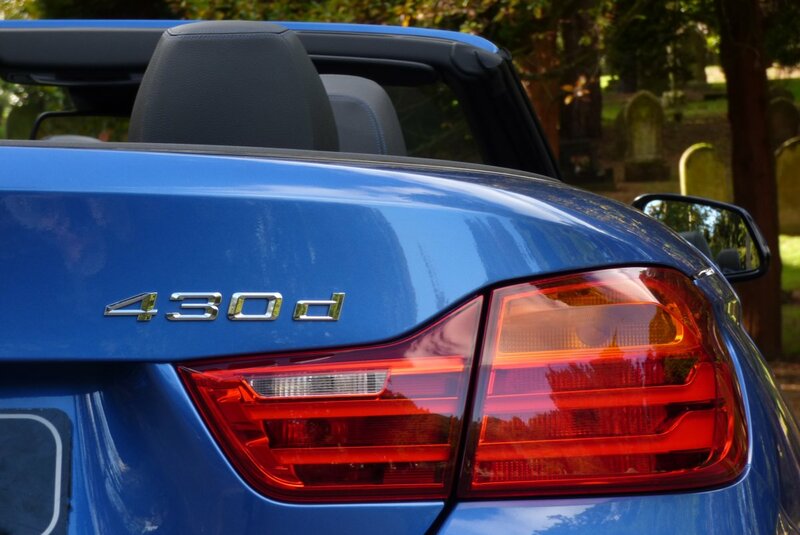 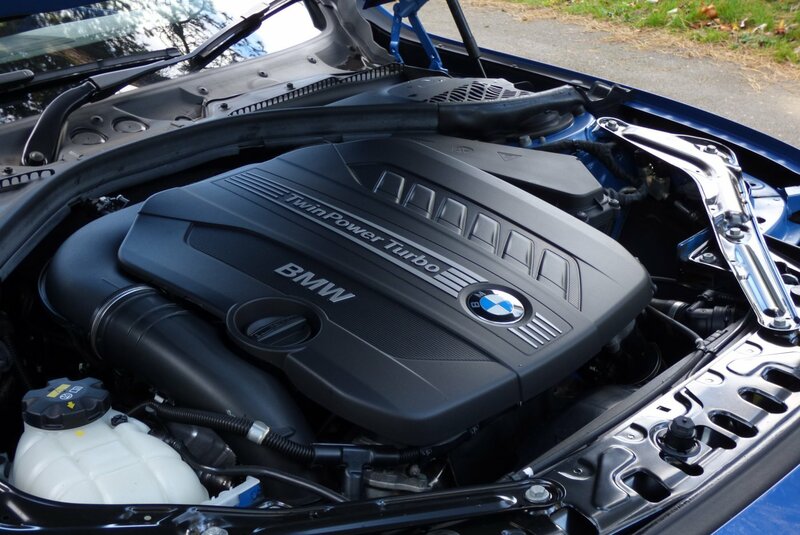 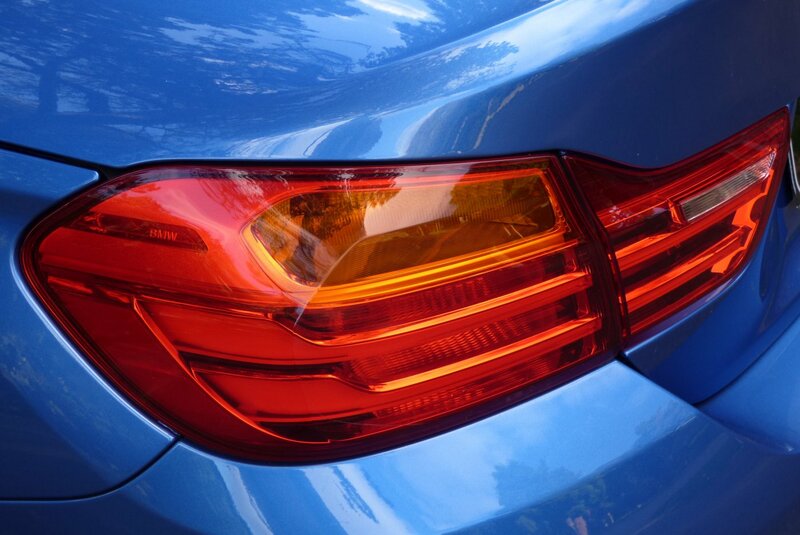 The 430d Features One Of The Few 6 Cylinder Engines In The 4 Series Line Up, A 3.0 Litre Twin-Turbo Engine, Producing A Healthy 258Bhp And Propelling The Car From 0-62 In 5.5 Seconds. 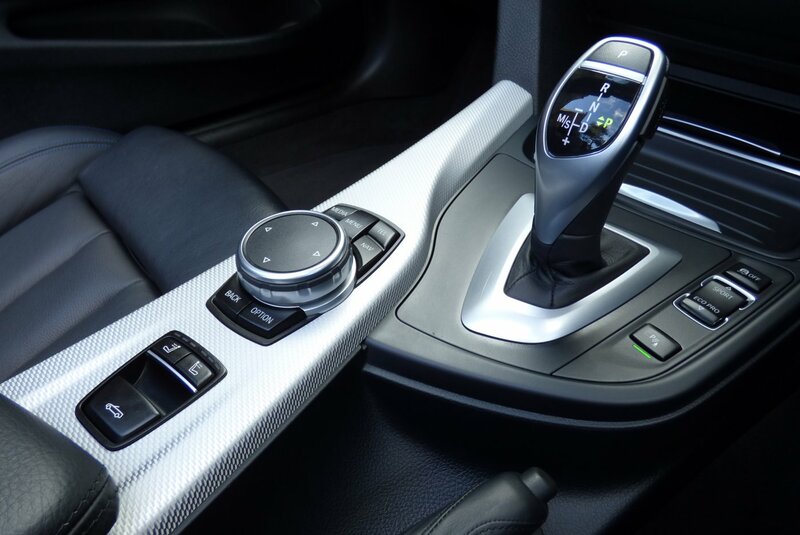 Being Twinned With The 8-Speed Automatic Transmission, The Combination Was Sounded Out As Being A Fantastic Driving Experience With A Mix Of Power And Fuel Economy. 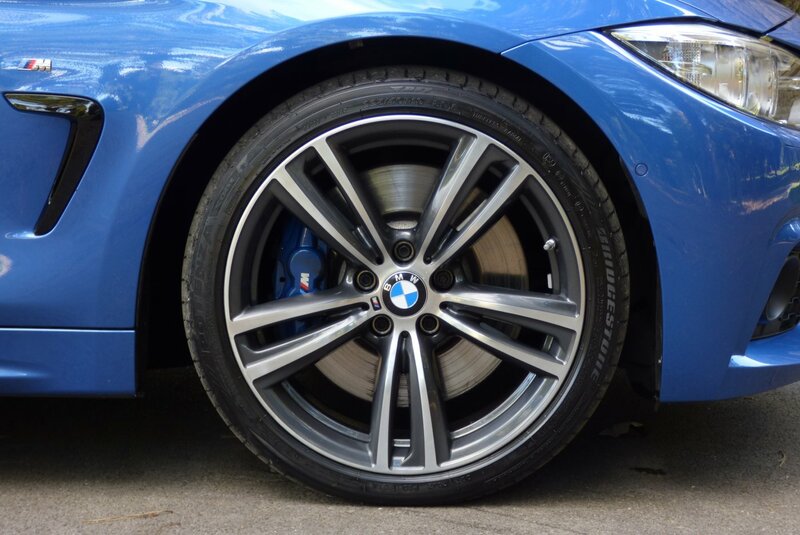 With The M Sport Plus Package Becoming Available In 2014, Giving The 4 Series A Meaner More Aggressive Body, Upgraded Suspension And Brakes To Match The Power Output. 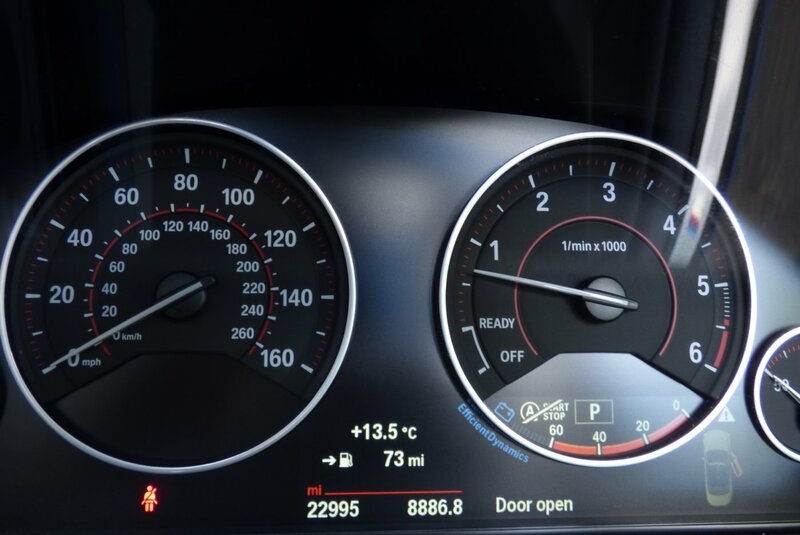 This Remarkable One Keeper Example Was First Supplied By Williams BMW In Manchester In The September Of 2014 And Since This Date Has Only Had Minimal Miles Applied. 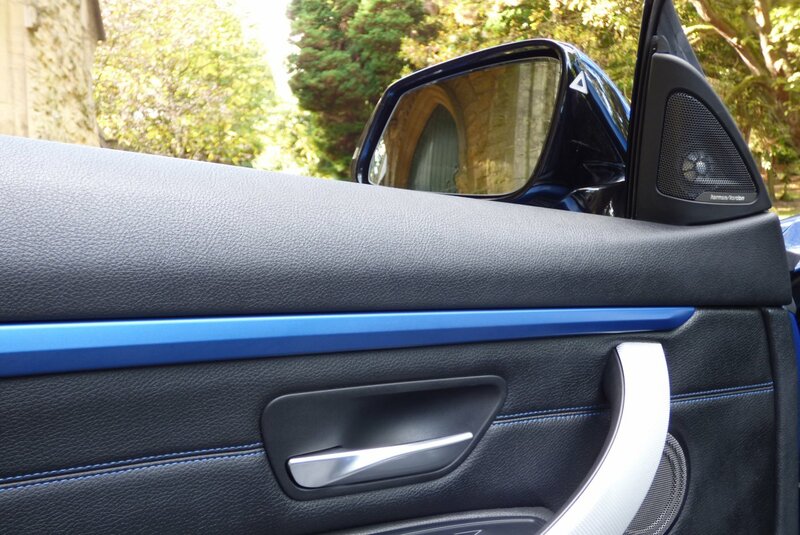 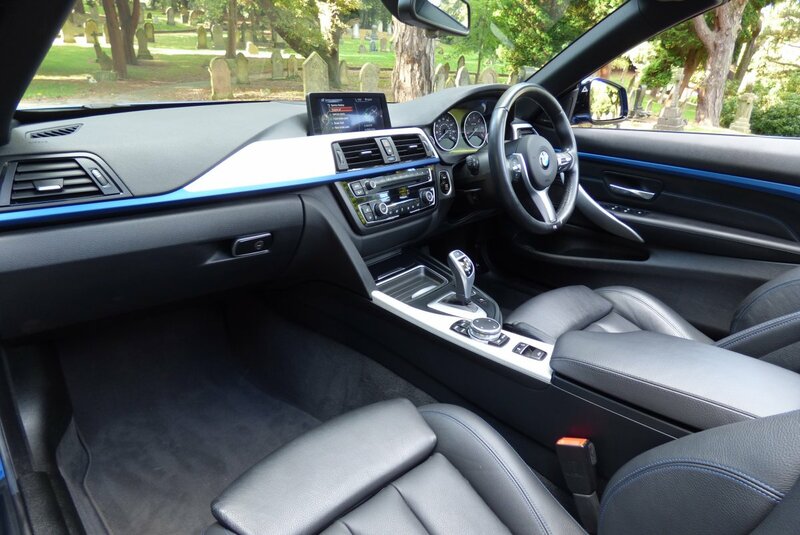 From Build The Car Was Opted With An Extensive Level Of High BMW Options, Along With Being Finished In One Of The Most Desirable Colour Configurations, So This Should Now Be Viewed As Being Rather Exciting For The Next Lucky Keeper. 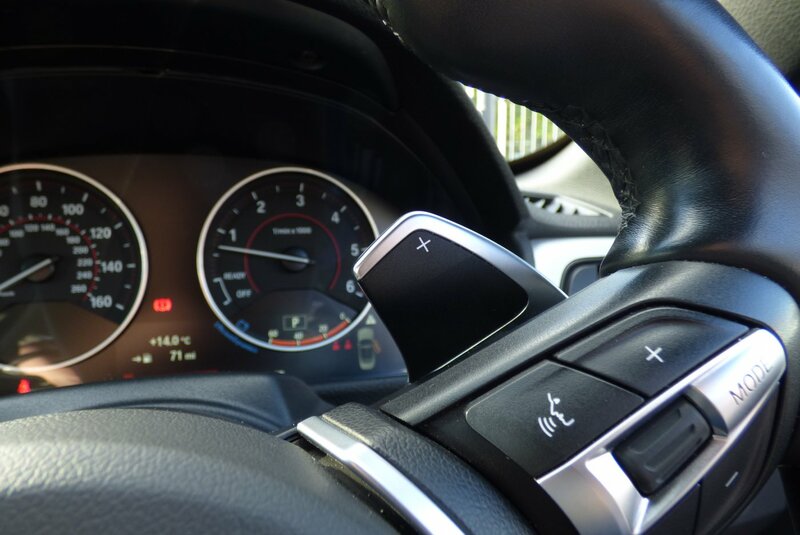 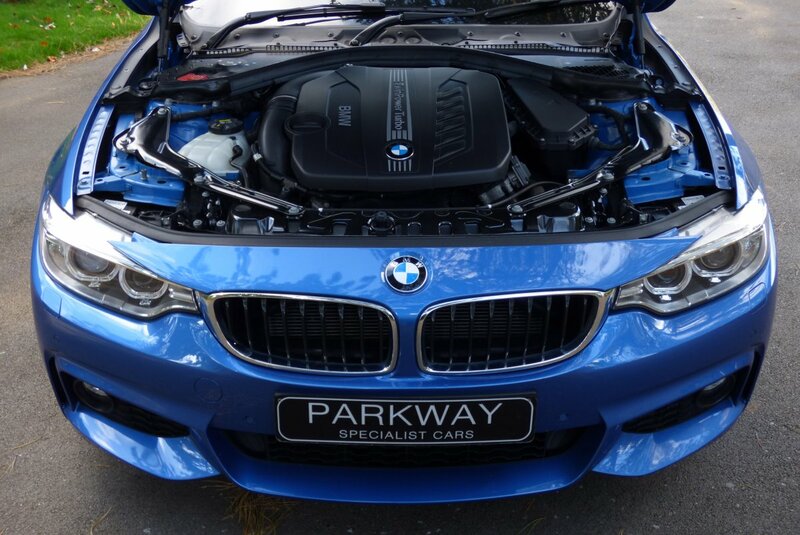 To Date The Car Has Been Serviced By Williams BMW In The June Of 2016 At 13145 Miles And Once Sold Will Have The Second Service Completed By Our Fully Trained And Knowledgeable Workshops. 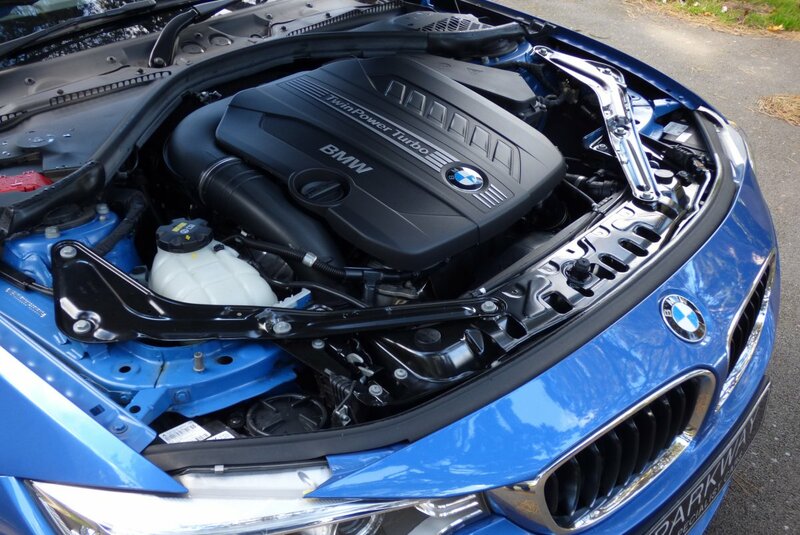 Once Sold The Car Will Be Presented With The Entire Booklet Pack Set, A Fully Cleared Hpi Report, A Factory Build Card And The Entire Fully Functional Key Set. 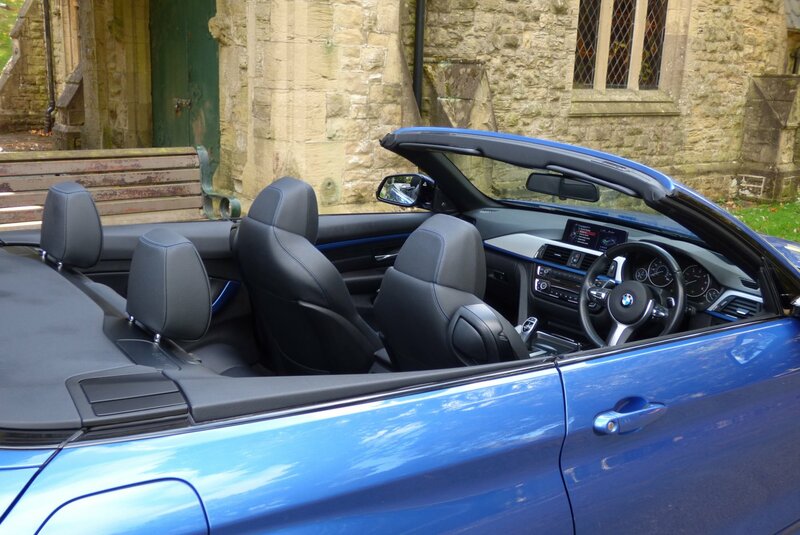 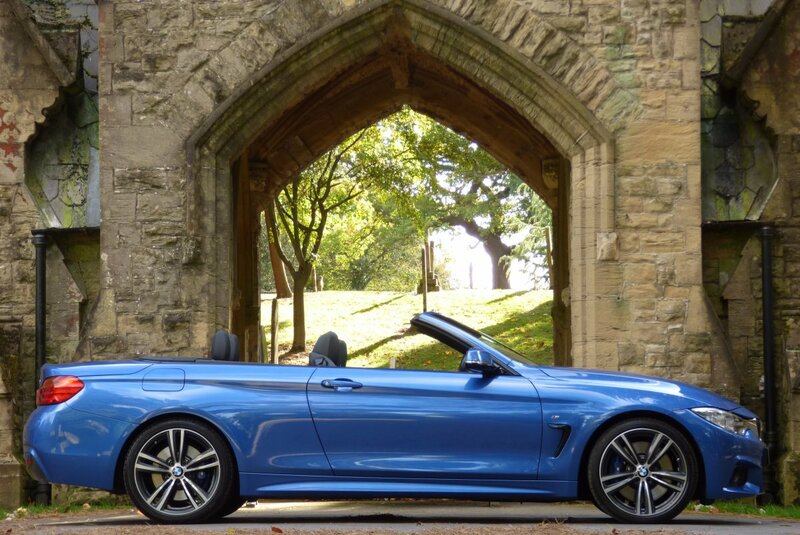 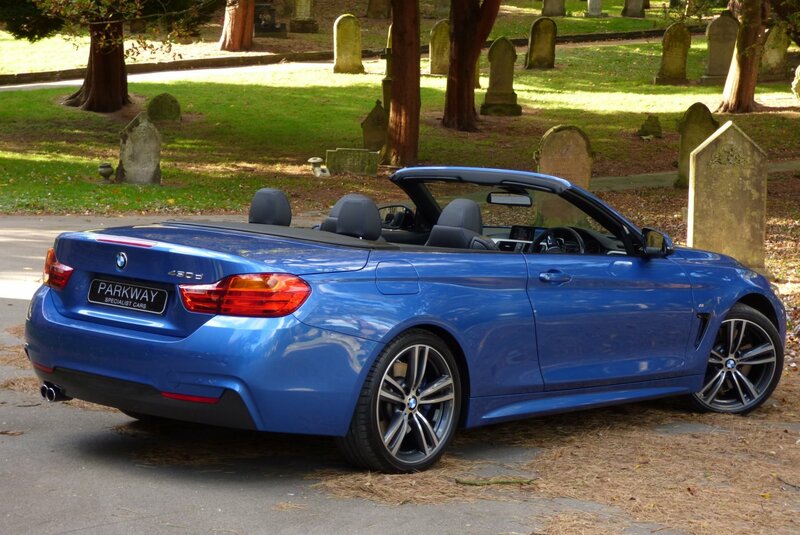 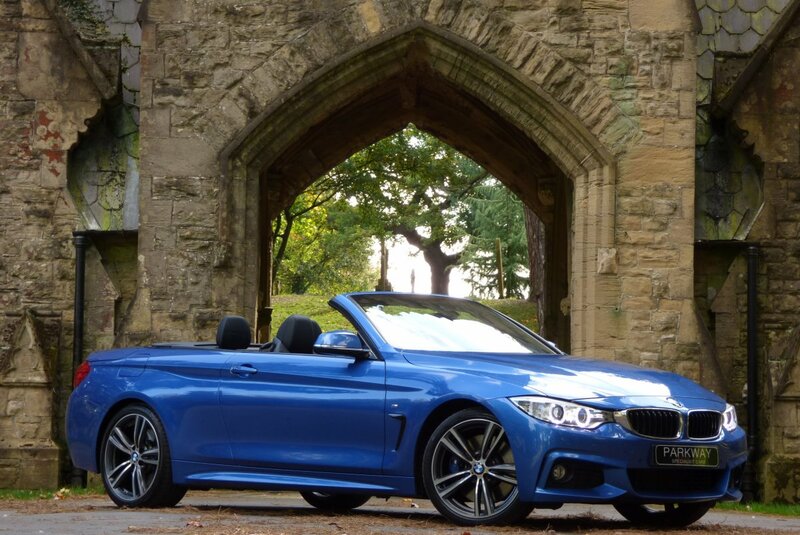 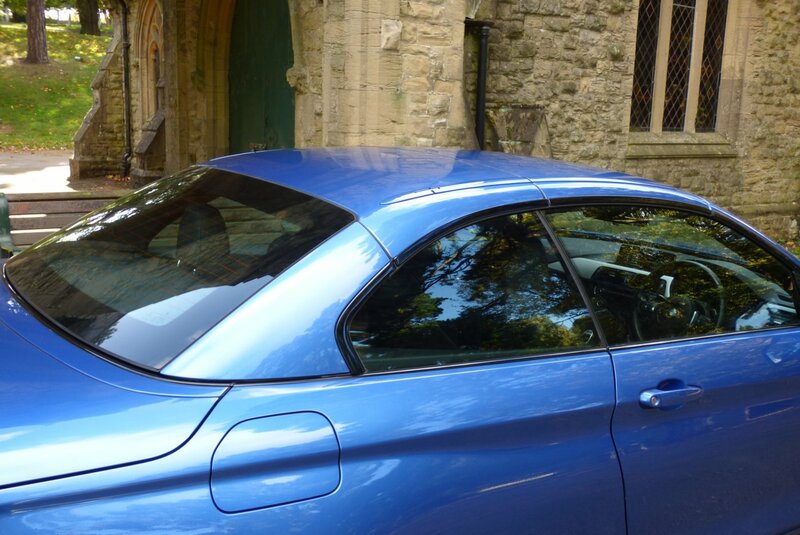 A Great BMW Experience, Either With The Roof Up Or Down.. 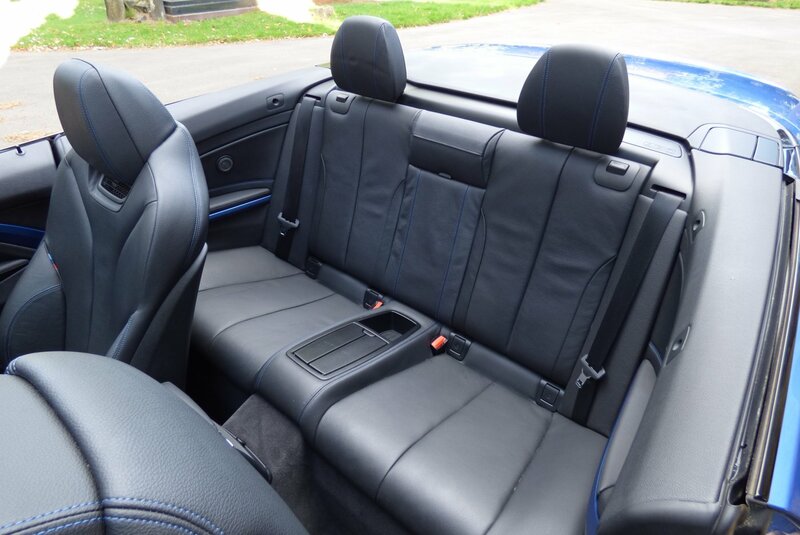 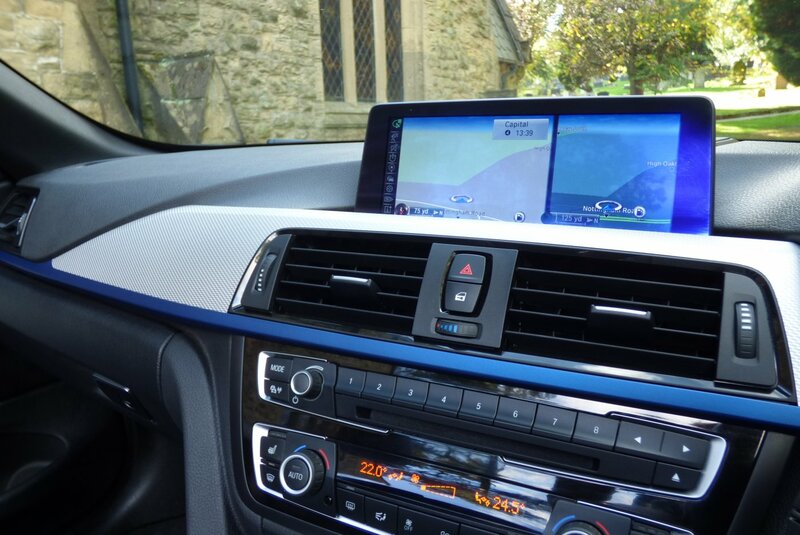 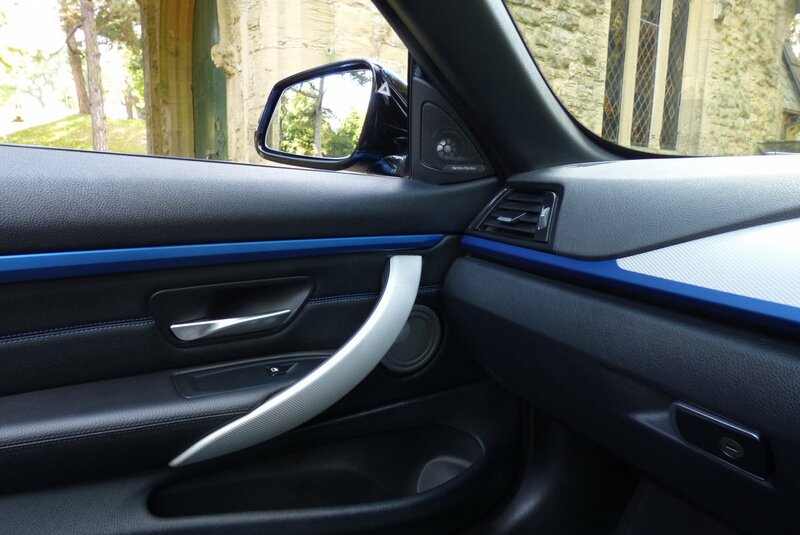 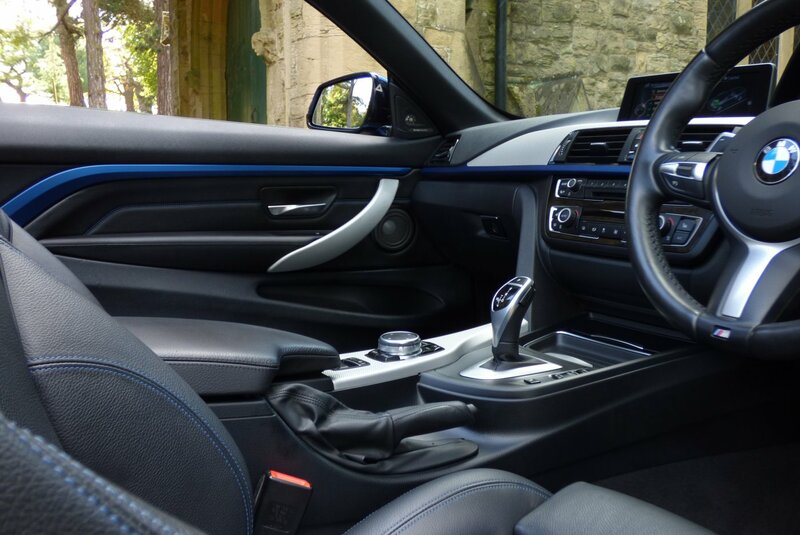 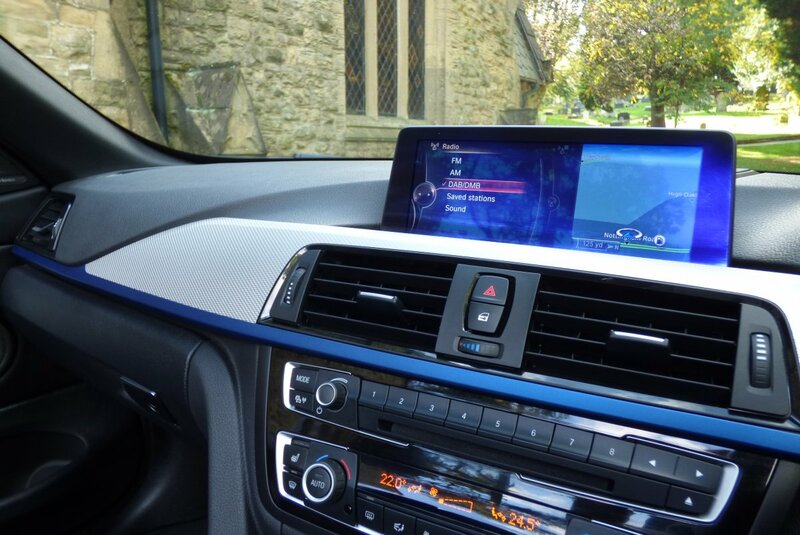 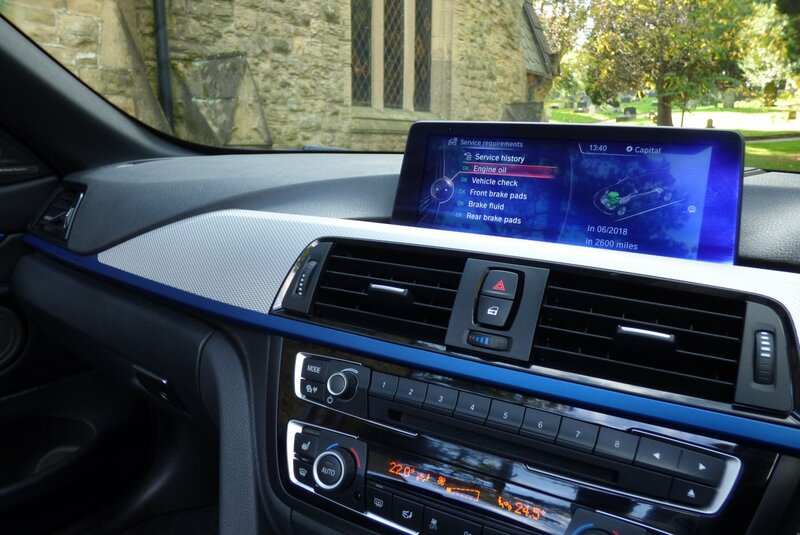 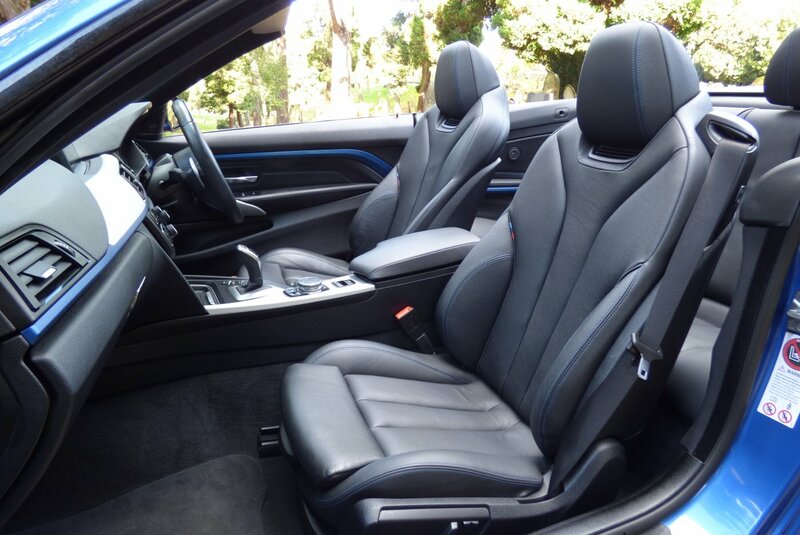 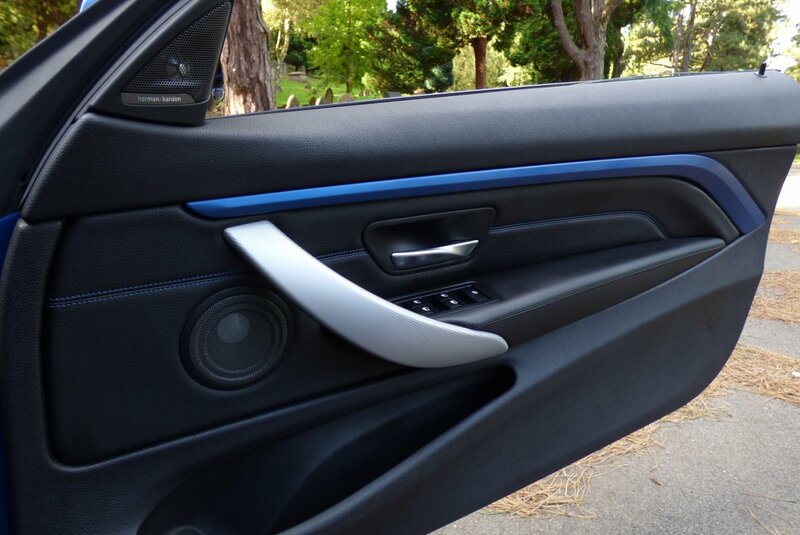 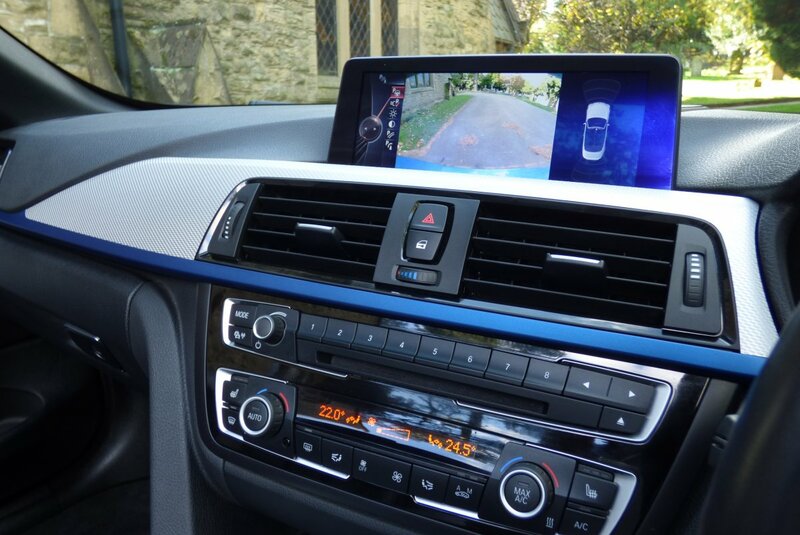 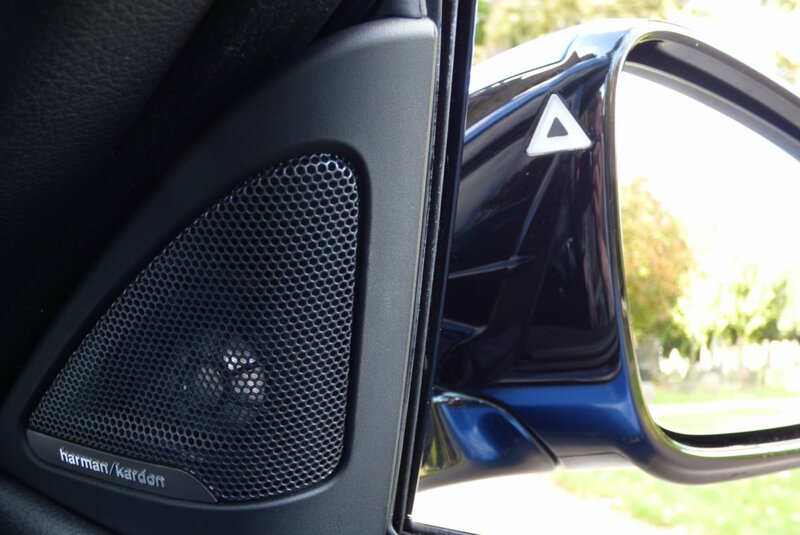 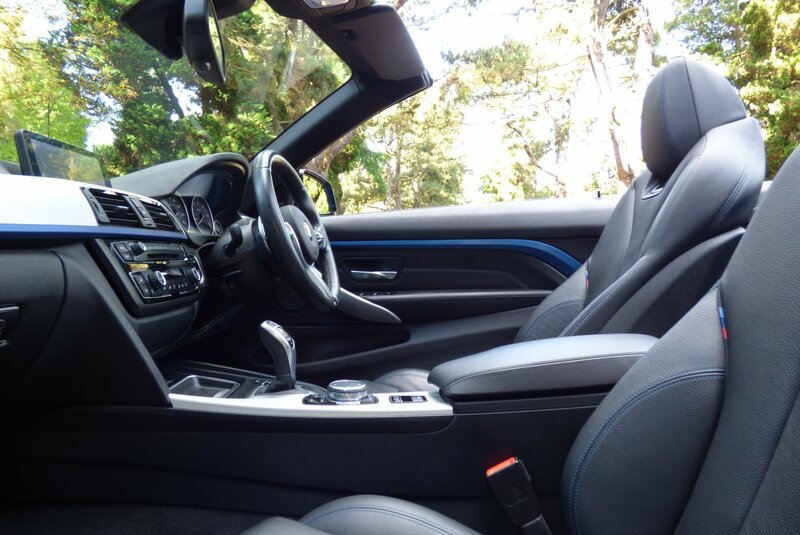 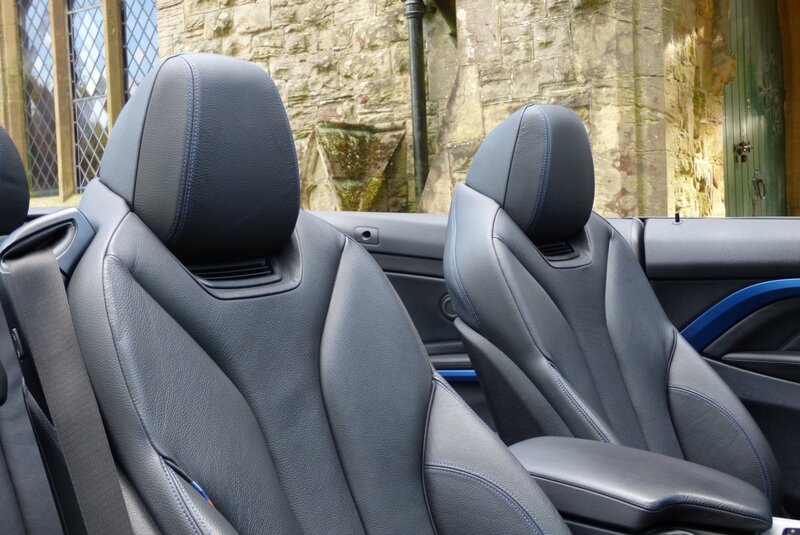 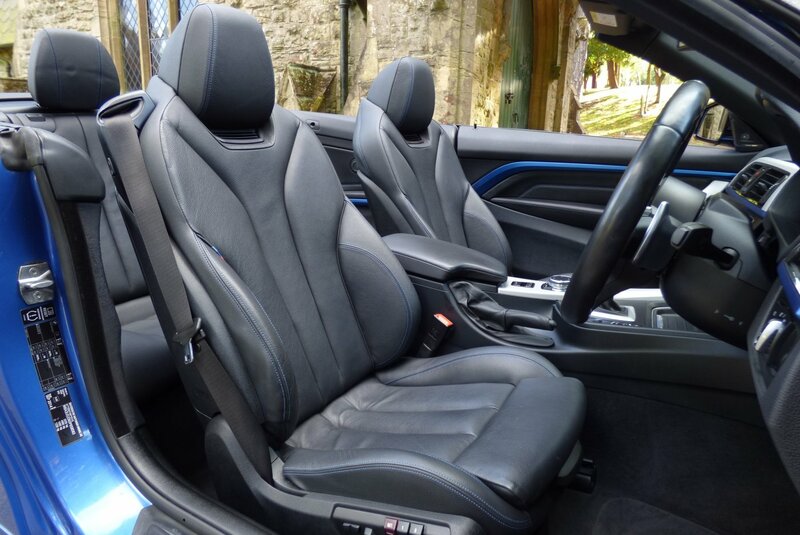 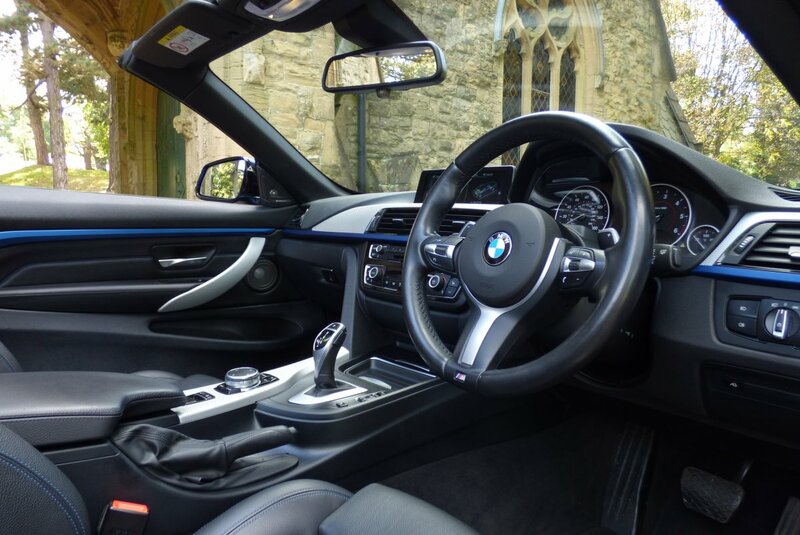 The Interior Is Stereo-typically German On The Design And Build Quality, Offering The Level Of Comfort That We Have Come To Expect Of A BMW Model. 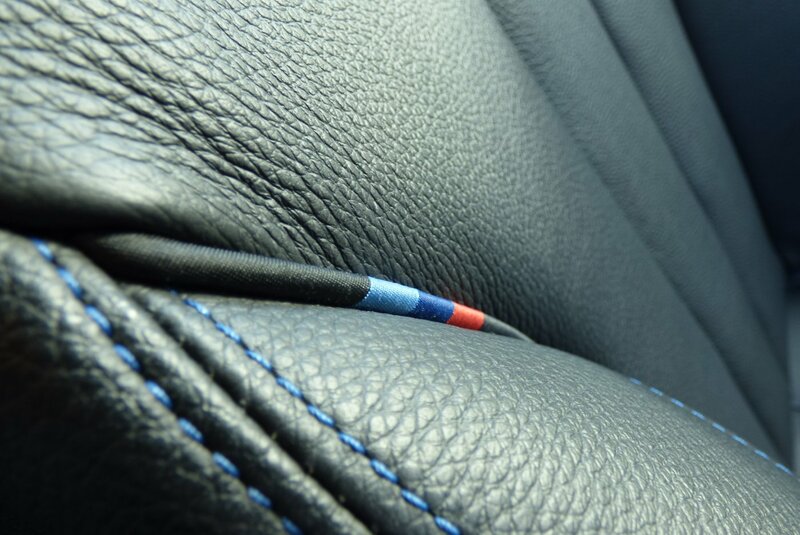 The Car From Factory Build Was Opted With Black Dakota Leather Sport Seats Beautifully Complemented With Blue Twin Needle Stitch Detail, Black Carpets, Black Fabric Roof Lining, Black Dakota Leather Trimmed Door Cards Again Detailed With Blue Stitch Work And Decorated With A Mixture On Aluminium Weave Inlays And Electric Blue Veneers. 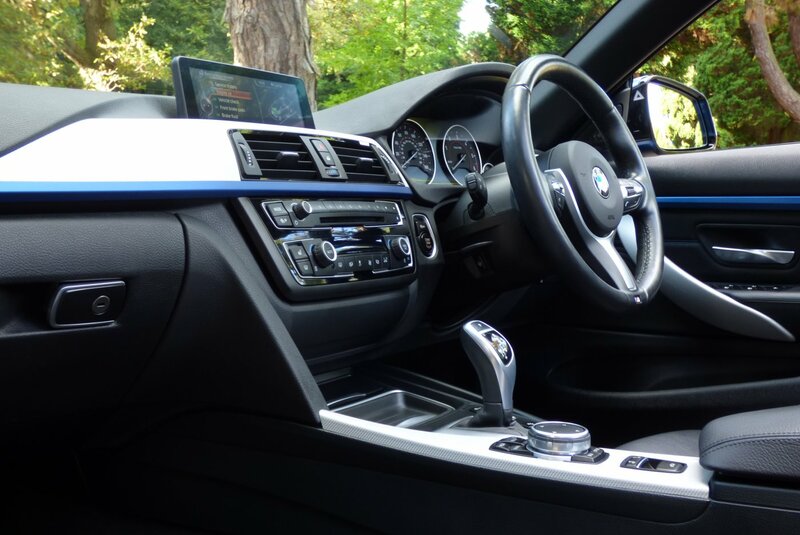 The Car Is Also Packed With A High Level Of Interesting Factory Options, Meaning That Every Trip Is Fully Controlled And Highly Enjoyable, Time And Time Again. 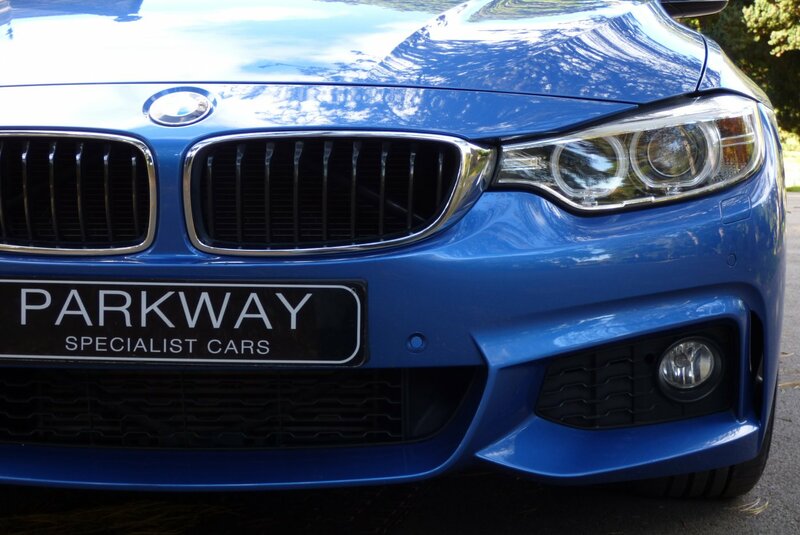 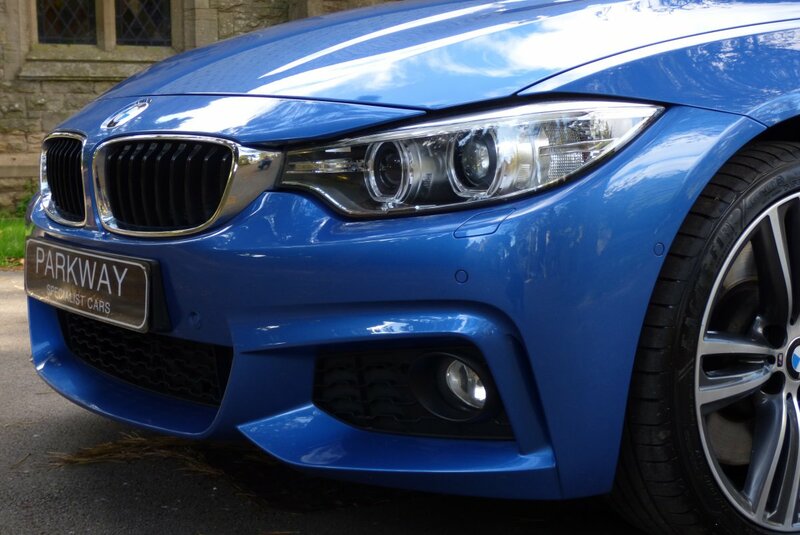 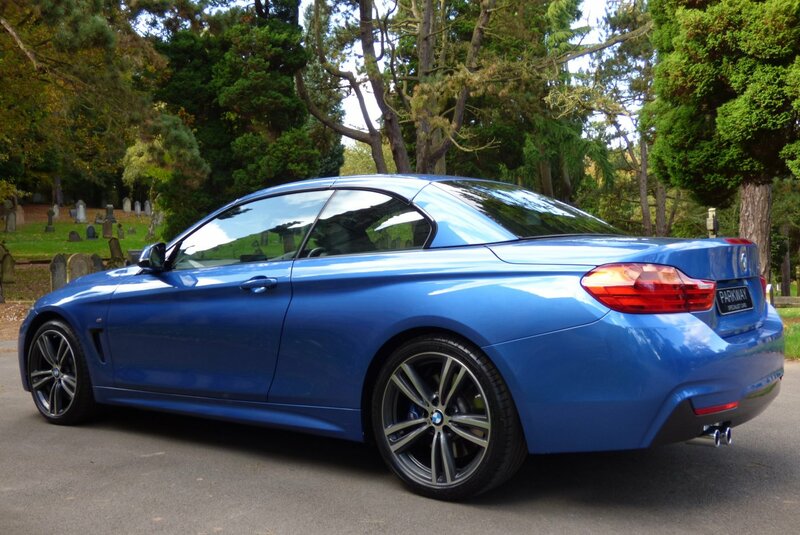 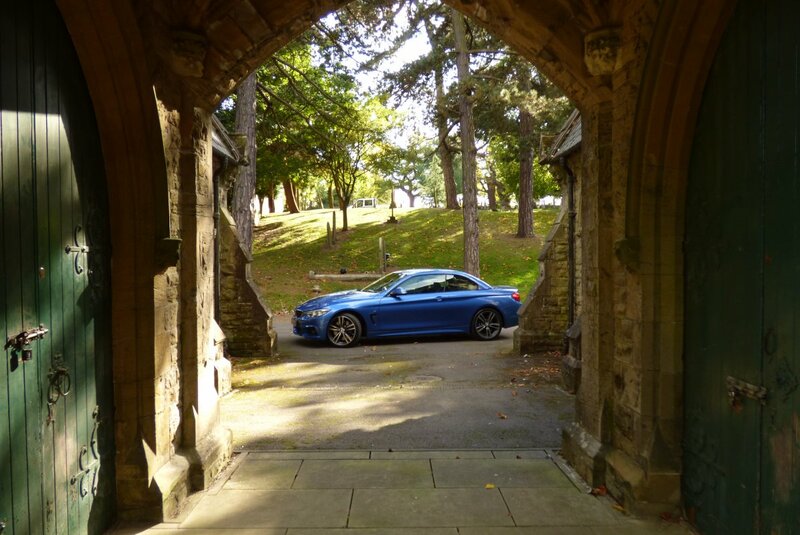 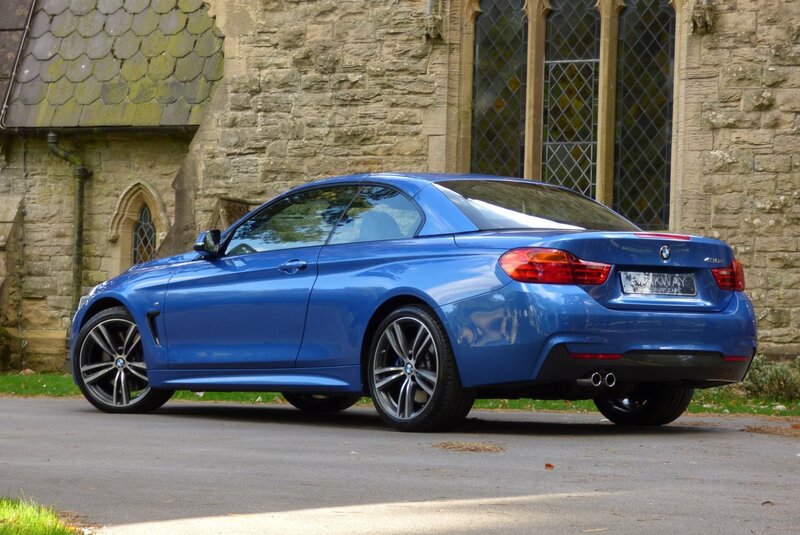 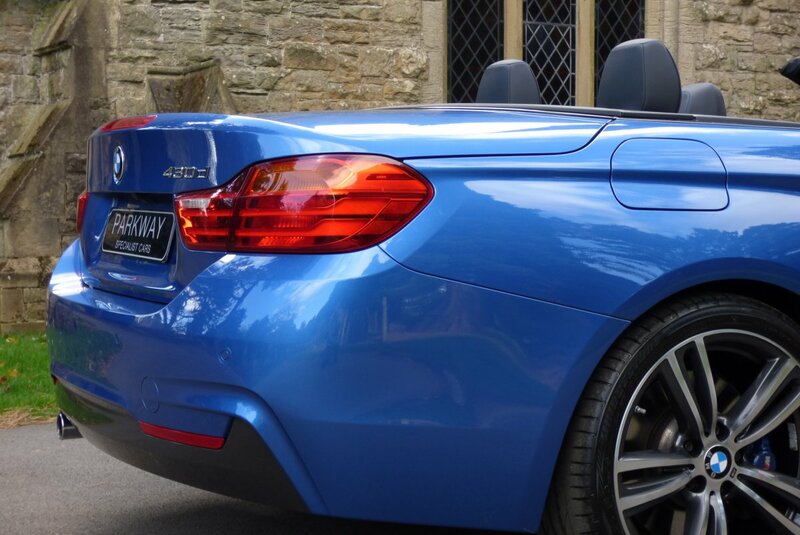 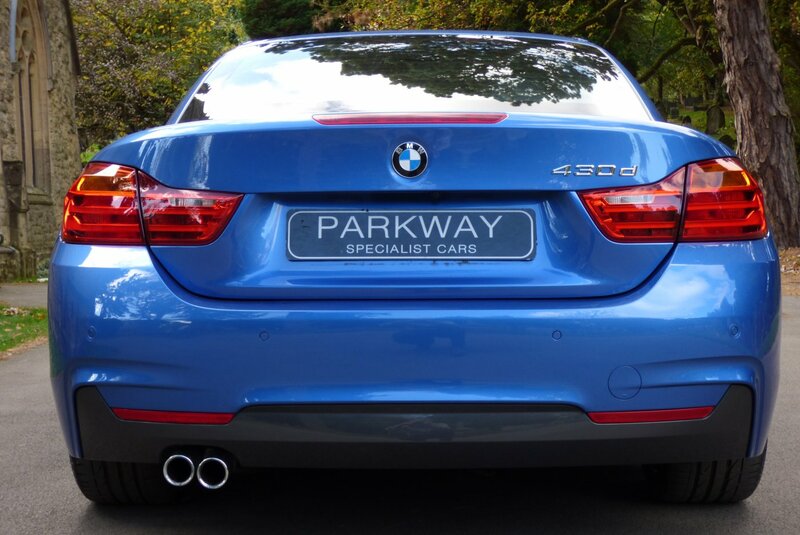 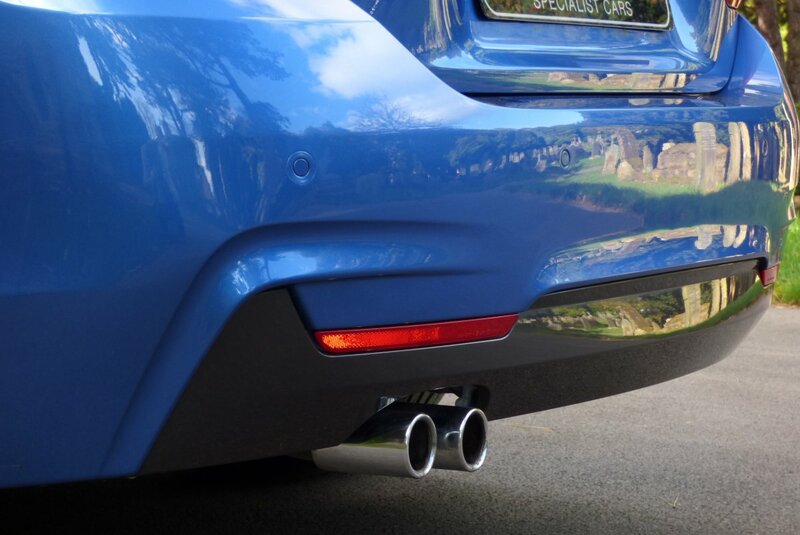 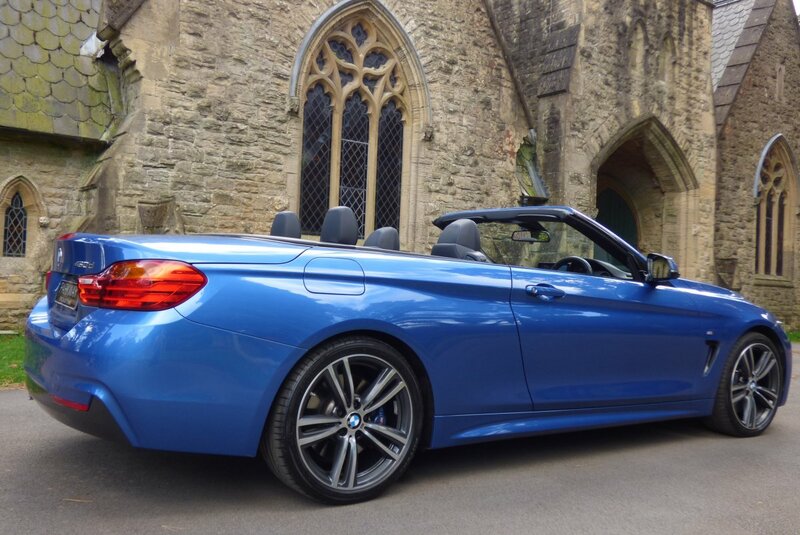 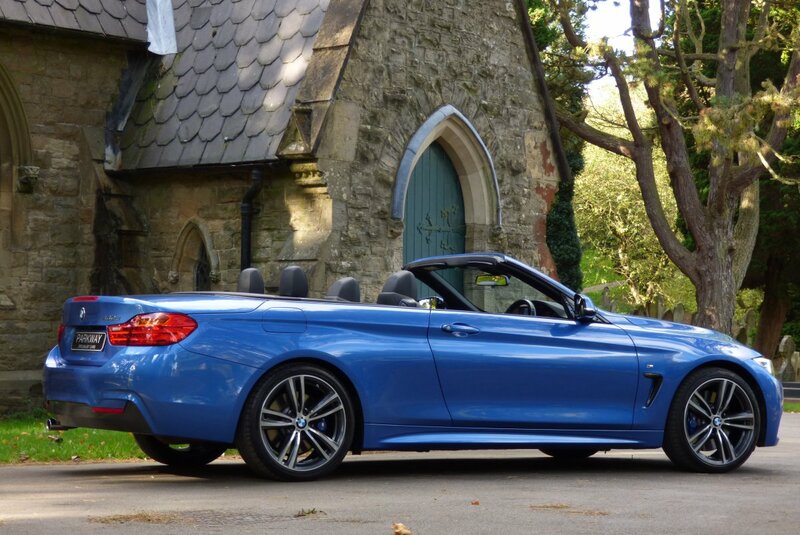 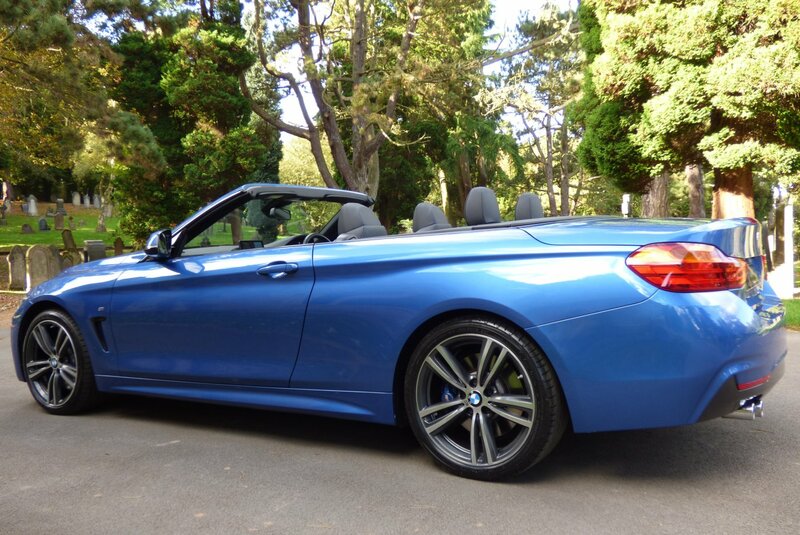 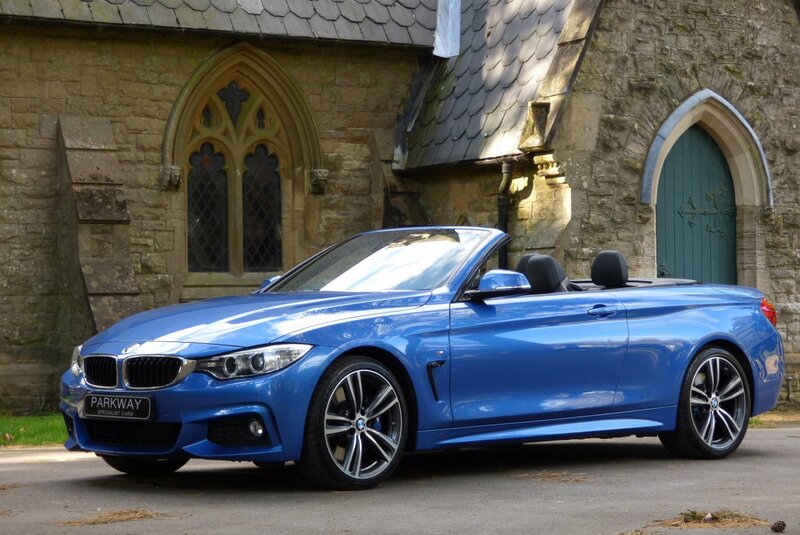 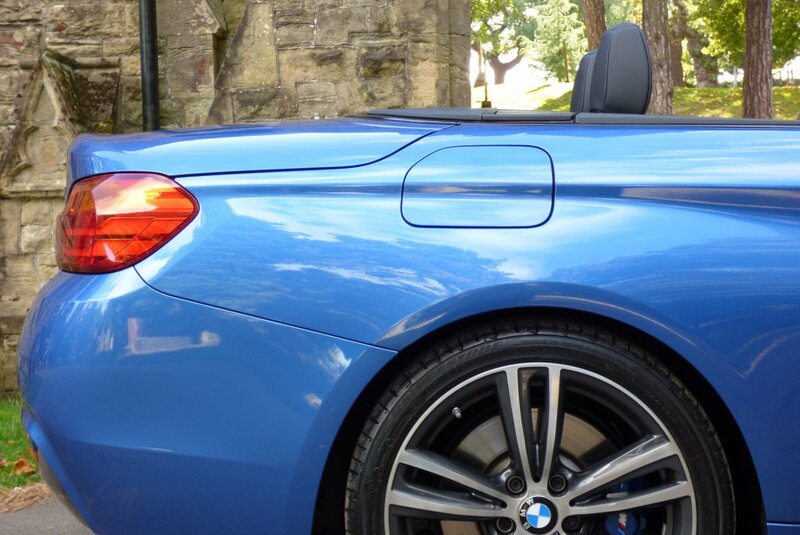 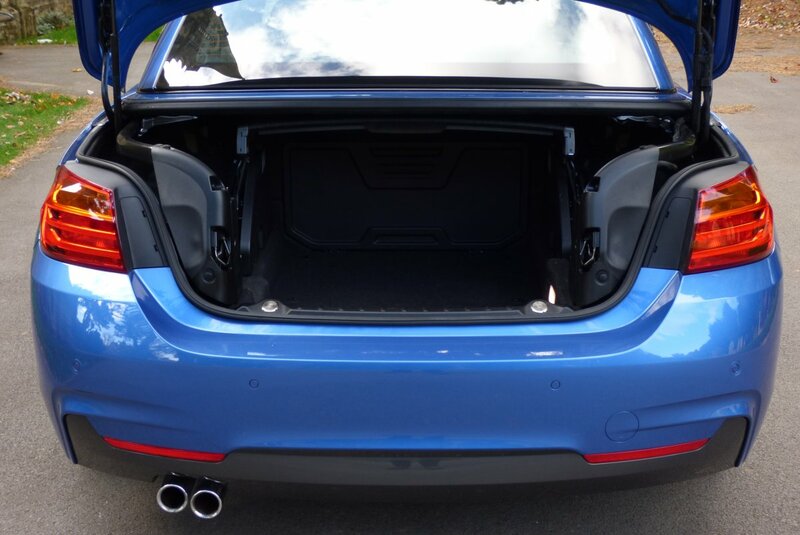 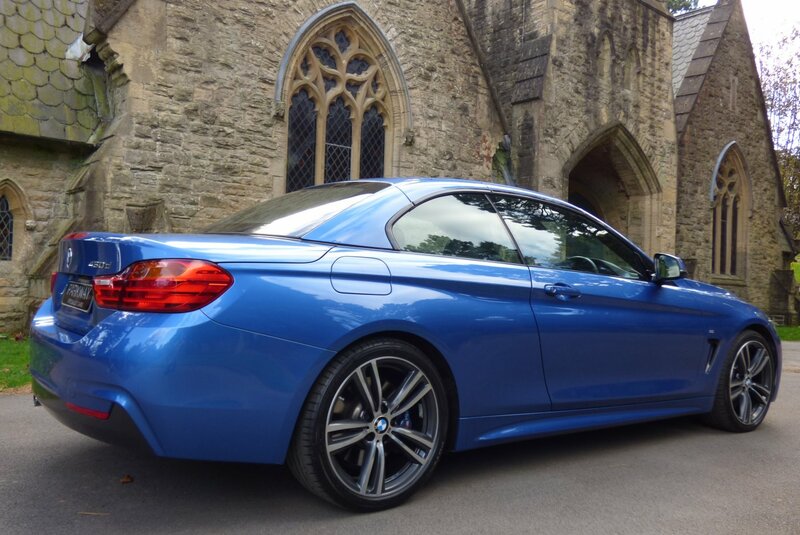 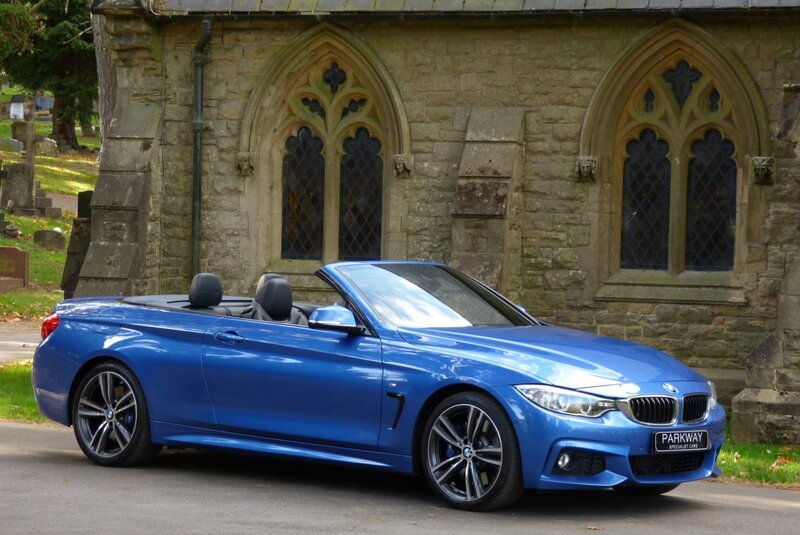 The Body Is Presented In Estoril Blue Metallic (B45), Which Is A Fantastic Colour Finish That Perfectly Demonstrates The Aggressive M Performance Styling Package, Signature BMW Exterior Lines And Looks Stunning With Or Without The Electric Solid Roof In Place. 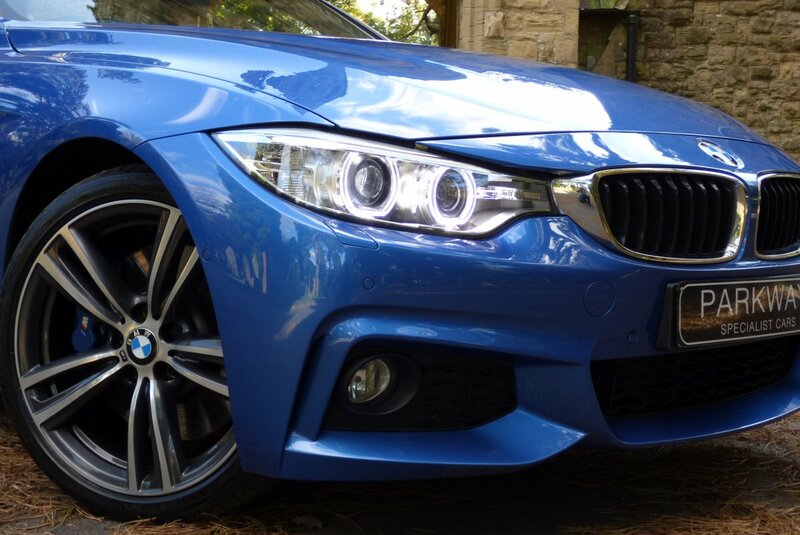 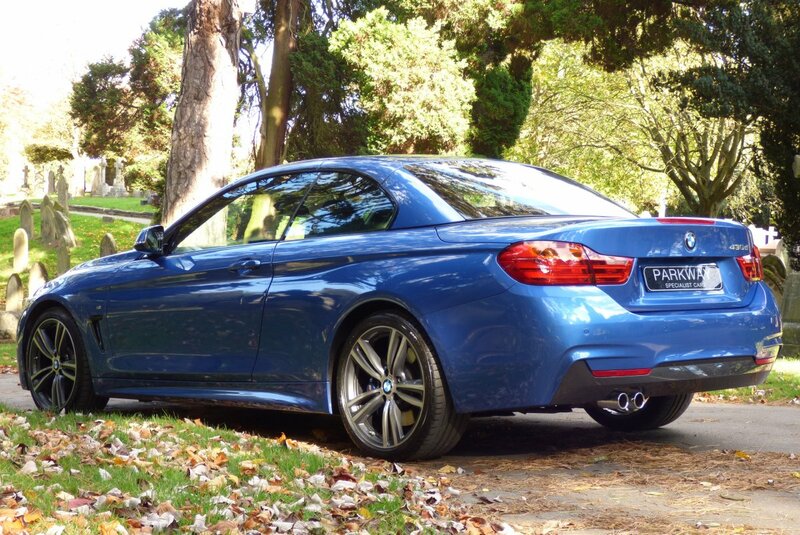 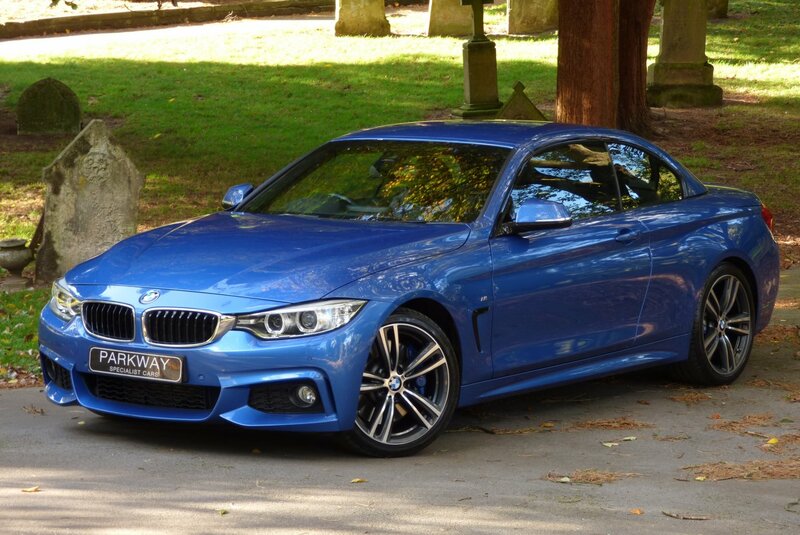 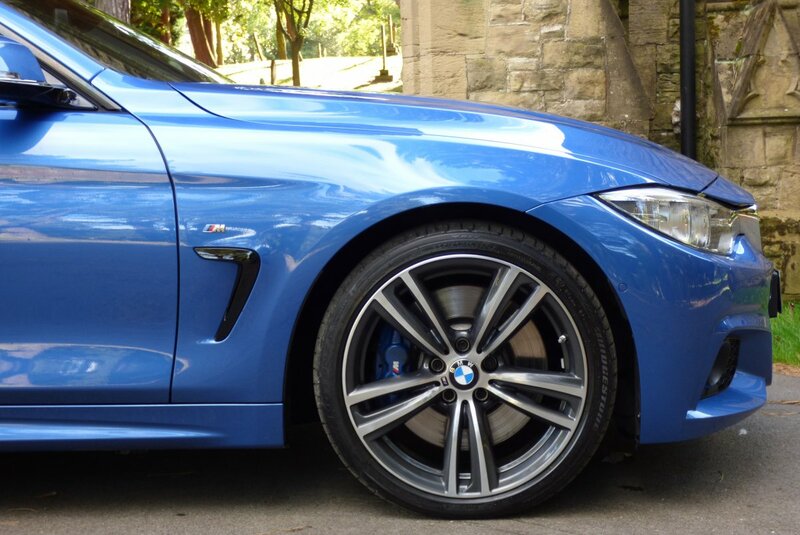 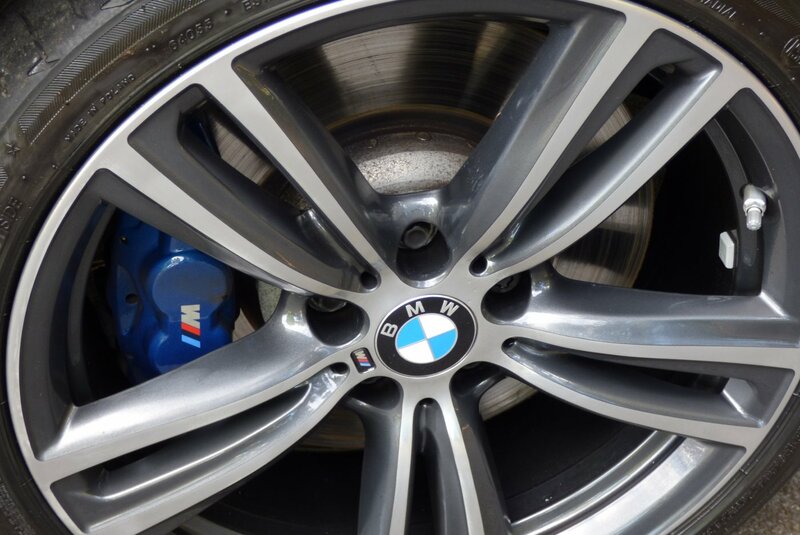 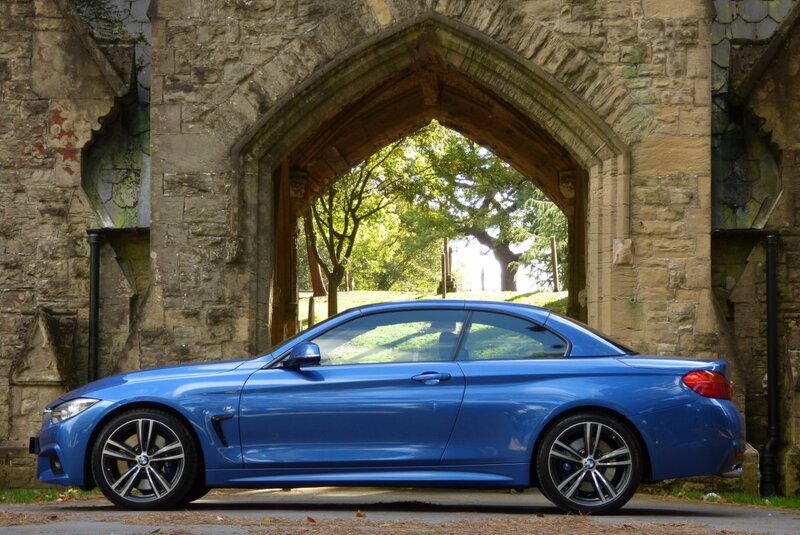 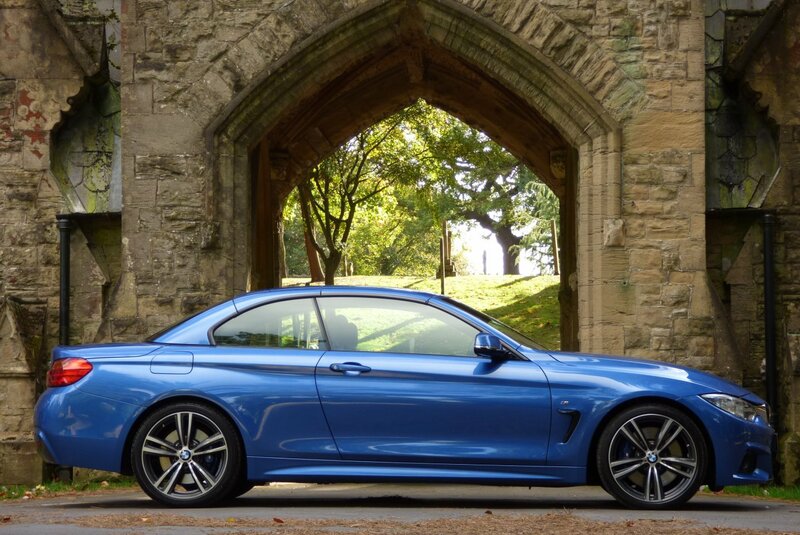 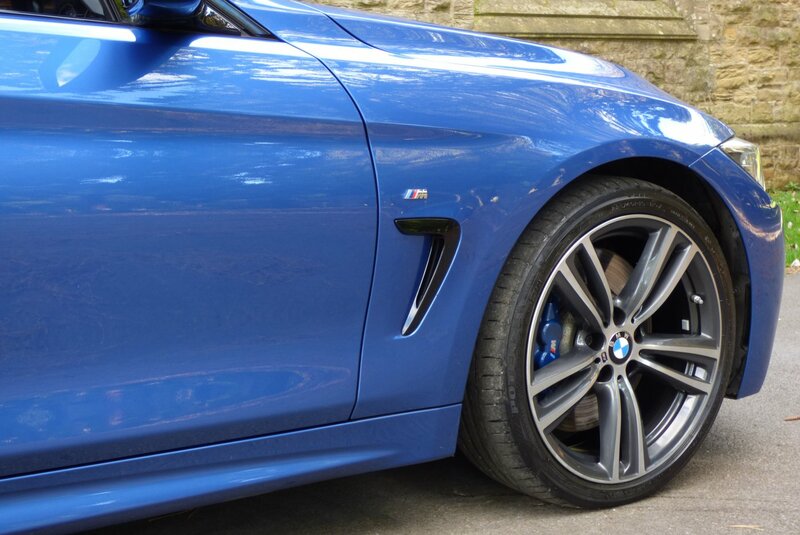 Further Exterior Features Include The Highly Desirable Unmarked 19" Bi-Colour M Five Double Spoke Alloy Wheels Which All Sit On Branded Tyres, The Blue Embossed M Performance Sport Brake Calipers, Chrome Finished Front Kidney Grille, The Gloss Black Side Vent Grilles, The Chromed Twin Exhaust Tips And Decorated With Chromed BMW Badges, That Finish This Dramatic Effect. 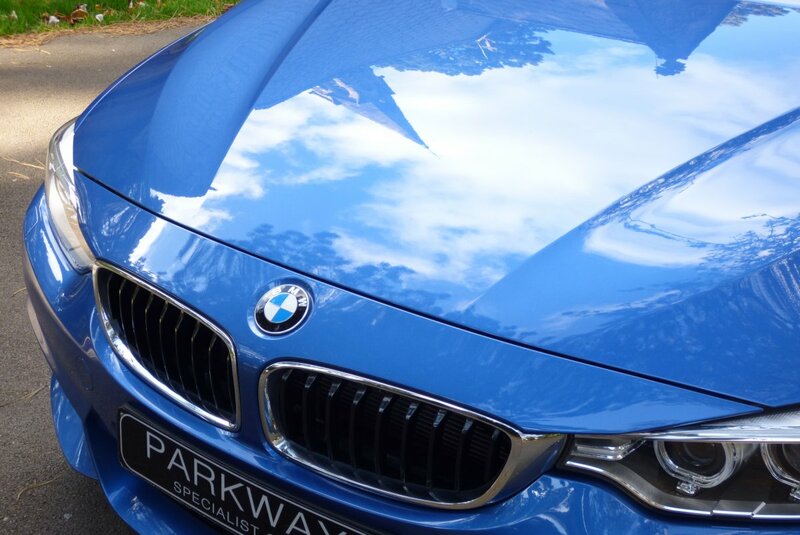 Come Rain Or Shine, The Car Looks Staggeringly Beautiful From Every Angle. 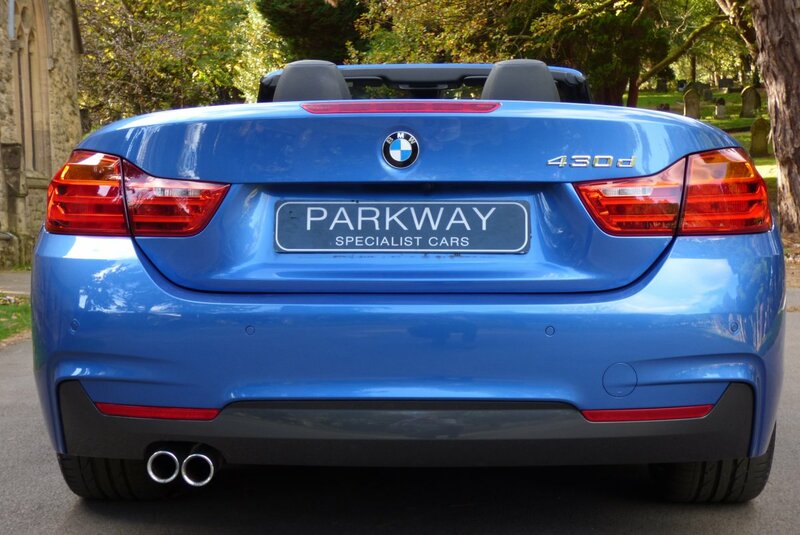 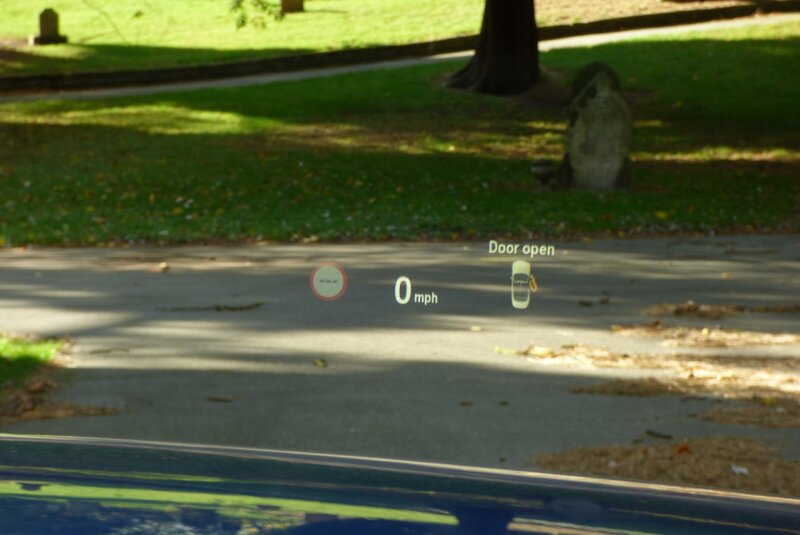 A Car That Offers So Very Much.. 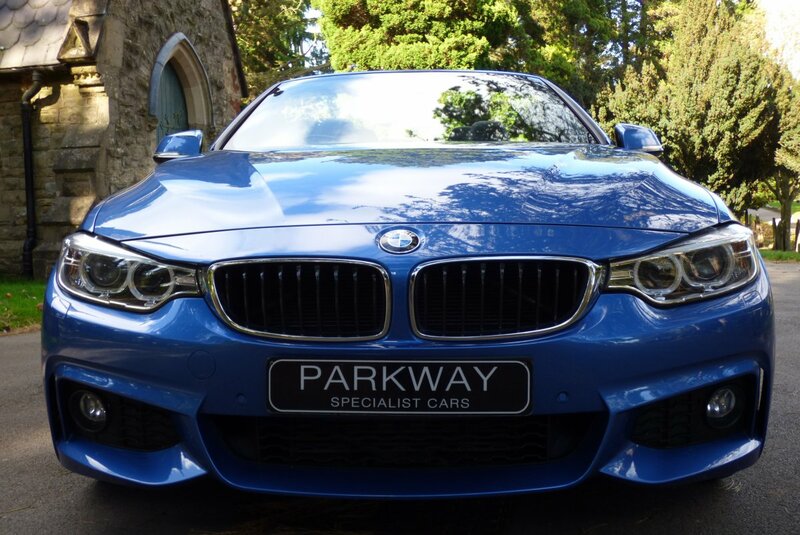 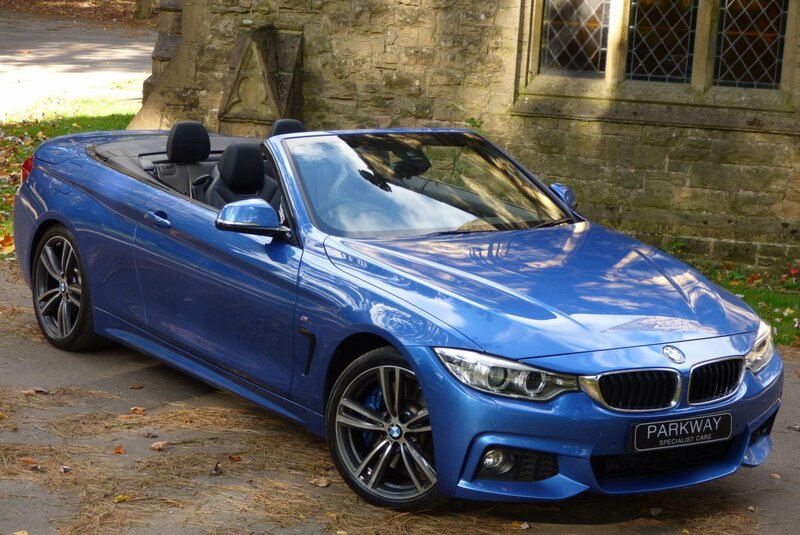 This Stunning Example Comes With Excellent Options From New To Include The Professional Navigation System With I-Drive, Unmarked 19" 704M Bi-Colour M Double-Spoke Alloy Wheels, M Sports Plus Package, M Performance Sports Blue Brakes, M Sports Suspension, M Aerodynamics Package, Leather Trimmed Multi-Function M Steering Wheel With Steering Wheel Heater, Variable Front Heated Seats With Neck Warmer Function, Electric Front Seating With Memory Function, Park Distance Control With Rear Reversing Camera, Park Assistant, Head-Up Display, Adaptive Xenon Headlights With Wash Function, High Beam Assist, Light Package, Daytime Running Lights, Harman/Kardon Upgraded Sound System, DAB Radio, Bluetooth Phone Preperation, Lane-Change Warning, Cruise Control With Braking Function, Automatic Dual Zone Climate Control, Key-less Entry, Push Button Start, Stop/Start Function, Variable Drive Mode, Automatic Rain Sensing Wipers, BMW Connected Drive Services, Remote Central Locking With Alarm, Hands-Free With USB Interface, Onboard Vehicle Maintenance Displays And So Much More.  Offered With The Full Booklet Pack Set, All The Keys And A Fully Cleared HPI Report. 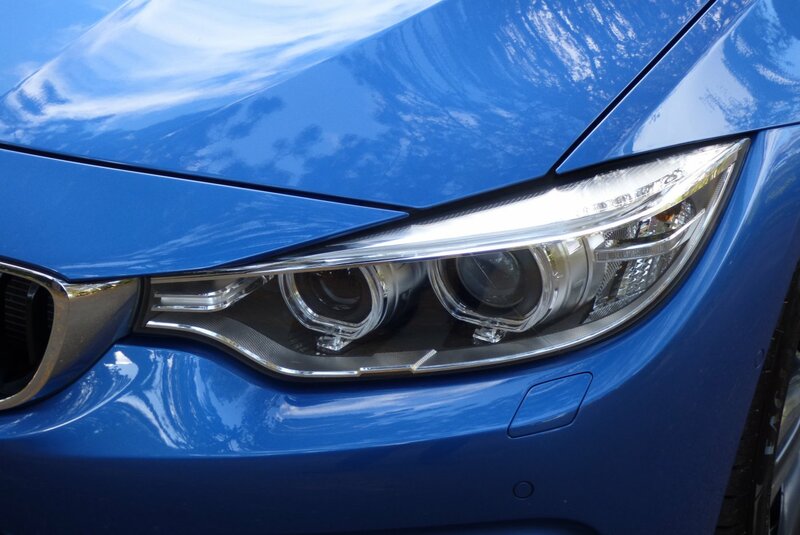 The Ultimate List Of BMW Options.